The story starts in 1903 and 1904 when St Agnes' Church of England, Kings Norton Methodist Church and Kings Norton Congregational Church were all built in sight of one another. The congregations came together every year in the week of prayer for Christian unity, and then went back home again. Nearly 80 years later the Congregational Church had become the United Reformed Church, and on 10 February 1980 its elders invited the councils of neighbouring churches to join them for Sunday lunch to discuss future plans. The Anglicans were just about to start a review of their work and witness, and at the lunch the three churches decided to do this as a joint venture. As a result of that study, the three congregations decided that the right way forward was together. 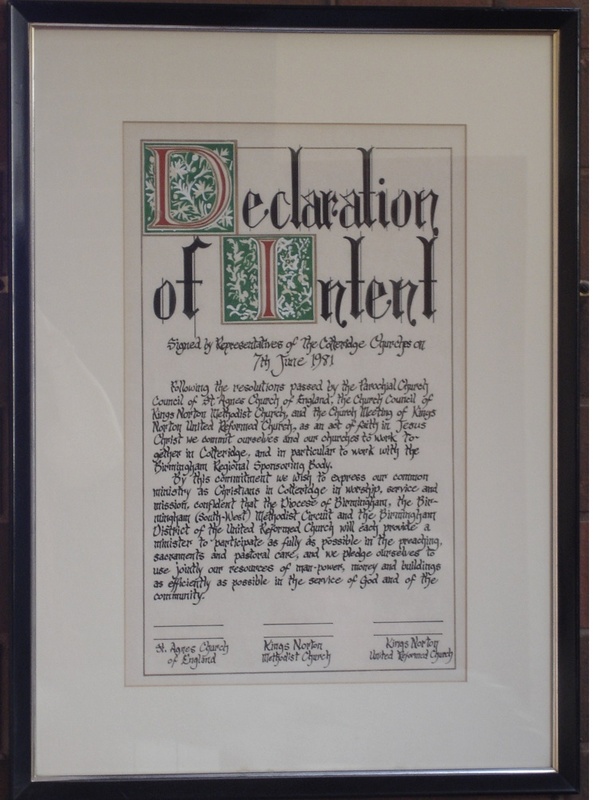 On June 7 1981, the Cotteridge Local Ecumenical Project was inaugurated, with a pledge to use jointly resources of people, money and buildings as efficiently as possible in the service of God and the community. Throughout the following two and a half years a steady growth in unity took place through worship, service, consultation and friendship, culminating in a decision to come together under one roof as a centre of proclamation, reconciliation, service and celebration. A further year of intense legal, organisational and practical problems resulted in the three congregations holding final services in each building, and then coming together in the hastily refurbished Methodist Church which, from 3 March 1985, became The Cotteridge Church. But the planning continued. The United Reformed Church was demolished and a sheltered housing complex - Cherry Tree Court - built on the site. St Agnes Church was declared redundant by an Order-in Council after a long battle, and demolished. A supermaket was built on the site. It could only have been Kwik Save, now the Cooperative! Plans were drawn up for a major refurbishment and extension of the Methodist Church. In January 1988 the people moved out of the old premises for a "year in the wilderness" with organisations scattered and worship continuing in a hired school hall. During this year a remarkable growth in unity occurred. So it was that in February 1989 a united congregation, with common communion and baptismal liturgies, returned to the church which had been extended and refurbished at a cost of £800,000. The new church incorporated a purpose built day centre for older people with dementia in a partnership with the Health Authority and Social Services. Since then many activities have come and gone, new initiatives are a constant part of life, and the church offers a range of opportunities which have- in the words of one local observer - "put a heart into this community"
Worship is at the centre of our life - but so is the coffee bar - and alongside them our many activities including the two day centres, reach out into the surrounding community. Almost 3,000 people come through the front door every week. In 2004 we won a national 'Church of the Year' award as a place where local people can touch and be touched by the love of God communicated in concrete form.